Our goal at Kane Family Dentistry is to provide patients with the highest quality dental care in a friendly, compassionate environment. We are committed to educating our patients on achieving and maintaining total dental health for a lifetime. When you first arrive at Kane Family Dentistry you will be greeted by one of our friendly receptionists. Patients of all ages are asked to fill out a health history form if you have not already received one in the mail. We want to be sure your experience with our team is as comforting and enjoyable as possible. The American Academy of Pediatric Dentistry (AAPD) recommends that children first see a dentist as early as six months of age and no later than one year. At this appointment, your child’s baby teeth will be coming in and we are able to examine the health of those first few teeth. After this appointment, be sure to schedule regular checkups every six months. We have multiple reconstructive solutions available for patients who are struggling with mild to severe tooth loss. We typically recommend dental implants above all else, which offer patients revitalizing health benefits, long lasting stability, and a beautiful, natural appearance. If you’re not a viable candidate for implants, dental bridges or dentures can also be a big help with replenishing your smile in a strong and lifelike manner. Every patient is different, and what works for one may not work for another. Dr. Kane would be happy to review these different options thoroughly with you before you make your final decision. Is there a way to straighten my smile without metal braces? Yes! At Kane Family Dentistry, we’re happy to offer Invisalign treatment to correct minor orthodontic issues. Patients want clear, customized aligners that are virtually unnoticeable, allowing them to make the changes patients want without sacrificing their self-confidence in the process. Contact our office today to schedule a consultation! If you are feel as though you are always out of energy and are too tired to keep up with your family and friends, you should give our office a call to talk about sleep apnea. This may be what is causing your issues, and a simple non-invasive treatment may be just what you need to feel great again. To schedule an appointment to talk about treatment options and a recommendation for how you should proceed call (563) 583-2789 today! A cavity is a small hole that forms inside the tooth because of tooth decay. Cavities will form when plaque buildup on the outside of the tooth combines with sugars and starches in the food you eat. This produces an acid that can eat away the enamel on you tooth. If a cavity is left untreated, it can lead to more serious oral health problems. Cavities can be prevented by brush your teeth at least two times a day and floss between your teeth at least once a day. Stay away from foods with a lot of sugar. This increases the amount of bacteria that grows in your mouth and can cause more plaque and potential cavities. Remember to brush your tongue! By doing this you will remove food particle which helps reduce the amount of plaque causing bacteria. It will also help keep your breath fresh! Schedule regular routine check-ups every six months. It is recommended that you see the dentist every six months. A filling is a synthetic material that dentist use to fill a cavity after all the tooth decay has been removed. 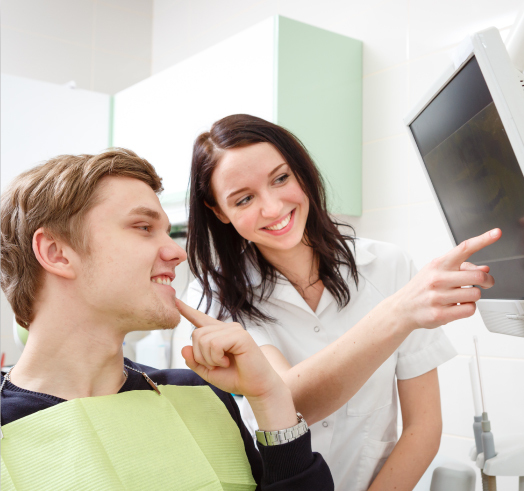 You are typically numb with anesthetic, so the filling generally will not bother you. Fillings are made from a variety of different materials, including composites, gold, or ceramic. If a filling is needed be sure to talk to our staff about what type of material is best for you and your teeth. We recommend adults and children change their toothbrush every three months. If you are using an electric toothbrush, read the directions before you change out the heads as they may not need to be changed as frequently. It is recommended for patients with gum disease to change their toothbrush every four to six weeks to keep bacteria from spreading. When finished brushing, rinse your toothbrush with hot water to kill germs and keep the bristles clean. If you’ve been sick, be sure to change your toothbrush as soon as possible. Gum disease, also known as periodontal disease, gum disease is mostly cause by plaque and bacteria buildup that is not treated in its early stage. Some other things that can cause periodontal disease include tobacco use, teeth grinding, some medications and genetics can play a factor. Remembering to brush your teeth regularly and visiting our office every six months will help prevent gum disease.